The Paikpara House at Belgachia was formerly owned by Prince Dwarkanath Tagore. He was popularly known as ‘Prince Dwarkanath’, both for his great generosity and for his high style of living. He entertained his European guests lavishly, and for the purpose he built up a grand suburban house on Belgachia Road, the legendary Belgachia Villa, in deference to his wife, who was religiously and socially orthodox. Dwarkanath had spent more than two lack of rupees for its construction and furnishing with period furniture, paintings and sculptures. 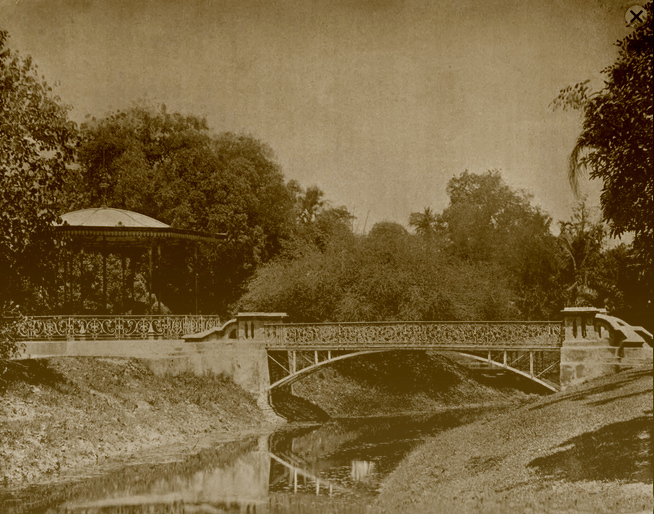 The garden house had a delightful lake, Moti Jhil, with two footbridges over reaching garden follies across water. When Dwarkanath passed away his much loved Garden House went to auction, and as reported on 23rd of December 1854 in Sambadbhaskar, the Singhees of Paikpara bought the estate at 54 thousand rupees only. The estate acquired its name Paikpara House, since then. Even after the ownership of Belgachia Villa changed, the tradition of throwing parties, however, continued. Amongst the most distinguished visitors were, King Edward VII, Prince of Wales, and the Marquis of Ripon, who paid their visit in 1875, and in 1882 respectively. The place became a centre of Bengali socio-cultural activities where Europeans waere also invited and take part. Because of the initiative of Pratap Chandra Sinha and Ishwar Chandra Sinha the Belgachhia Theatre came into existence. It was under such auspices that Pandit Ram Narayan’s drama, Ratnavali was to be acted at Belgachhia Garden House. The English translation of the drama, for the European guests, was done by Michael Madhusudan Dutta. In July 1858, the drama was acted under circumstances of pomp and scenic decorations which surpassed the utmost expectations. Everyone was charmed with the acting ; and new era was opened for the Bengali drama. The details of photographs, namely, dates and the names of the photographers were not known as yet. It is, however not unlikely that it was Sarat Chandra Sinha, the youngest son of Pratap Chandra, an expert in photography and engineering who capured the vews of the building he himself made some modifications. This entry was posted in Establishments, Ways of Life and tagged Belgachhia Garden House, Belgachhia Theatre, Belgachia, Belgachia Villa, calcutta, Ishwar Chandra Sinha, King Edward VII, Marquis of Ripon, Michael Madhusudan Dutta. Sarat Chandra Sinha, Moti Jhil, old calcutta, Paikpara House, Pandit Ram Narayan, Pratap Chandra Sinha, prince dwarkanath, Prince Dwarkanath Tagore, Prince of Wales, Ratnavali, Sambadbhaskar.